Fun and Instructive Professional Putting Aid - Kinetic Ball Returner - Addictive Matchplay Game - Includes Free 8 foot green Carnoustie Putting Mat (Stimpmeter 11.5, USGA: Fast) - Includes Free Instructional VCD - Ingenious 2-Ball System - Fully Adjustable - length, break & distance - Silent, gravity operated mechanism - Compact & Portable - Better Feedback than other putting aids - More repetitions per minute than any other ball returner - More fun - Groove a pro's stroke in weeks - Maintain a professional stroke in less than 15 minutes a day - Highly efficient - Never chase golf balls under the furniture again - Use on any flat surface - Virtually silent - No batteries or power required - Better quality feedback than other putting aids - More reps than other ball returners - Challenging - Play for hours - Used by tour pros to fine tune muscle memory - Use anywhere without needing to retrieve a ball - Once set every putt becomes an identical challenge of perfect line and perfect pace - Get it right and the Boomerang alternates a lag putt followed by a matchplay putt up to 500 times an hour, get it wrong and the ball is back at your feet to try again - Your putting stroke will see remarkable improvement after using it. 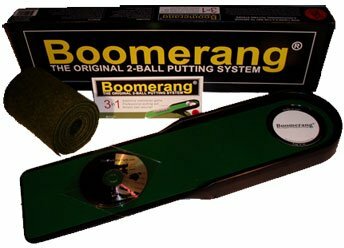 If you have any questions about this product by Boomerang Golf, contact us by completing and submitting the form below. If you are looking for a specif part number, please include it with your message.